What's the opposite of Death? Think life? Nope, it's Love. So I'm a huge Belle fan. Love her! My biggest disappointment last week in Disney was not being able to meet her. And yes I'm totally serious. 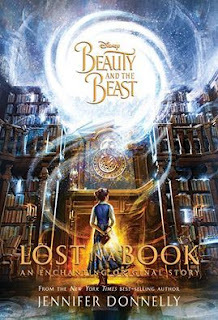 Beauty and the Beast: Lost in a Book begins with Love and Death. They are sisters and the total opposites of each other. (In case you didn't get that with their names.) They have been watching Belle and the Beast and Love is confident the spell will be broken. Death, as you can imagine, would prefer not. They wager, and Death decides to cheat. Meanwhile, Beast tries to make Belle more comfortable in the castle and gives her his library. We all know how much she likes books. But Death has a plan. She plants the book Nevermore in the library. Nevermore is an enchanted book. You don't just read the book, you enter it. Belle enters the book and meets wonderful characters who treasure her, value her, make her feel like she has friends. But it's a trap that Death has set, in order to capture Belle and keep her there, preventing her from returning to the Beast, and possibly breaking the spell. While we all know the story of Beauty and the Beast, we know that the spell eventually breaks, but what's wonderful here is watching Belle struggle with her two realities. Are her friends in Nevermore real, or her friends in the castle?